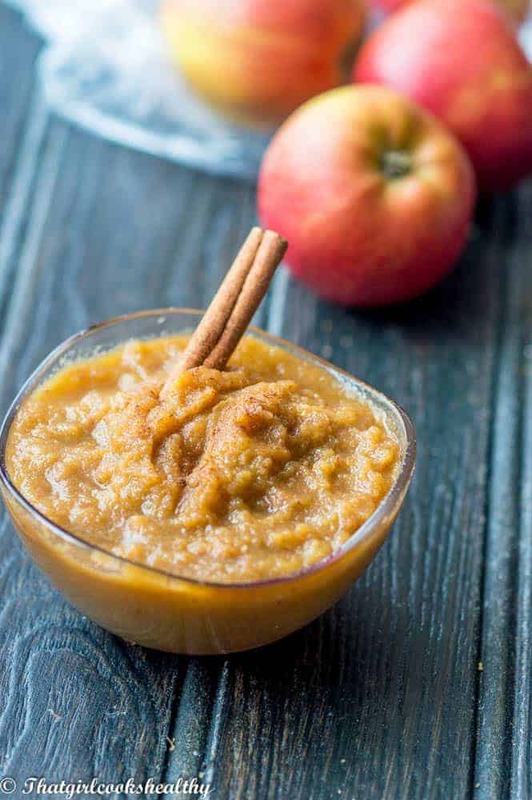 Cinnamon applesauce recipe – Learn how to make delicious spice infused applesauce with a squeeze of lemon, pitted dates and blitz in a high speed blender. This is a really quick cinnamon applesauce recipe that will come in handy for a number of culinary arts. The best thing about this applesauce is that it’s raw, meaning all the nutrients are maintained and not boiled out like most of the store brought ones. As of lately I’ve been dabbling with various baking treats and incorporating apple puree. What I’ve found is that applesauce can be used in place of unsaturated fats and sugars. This is a type of healthy applesauce that’s cost effective, delicious and multipurpose. Plus cinnamon and applesauce compliment one another so what’s not to love??? 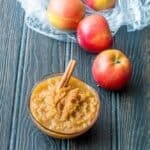 To make this fibrous apple sauce recipe, you don’t need to do anything other than to core and quarter the apples plus add the extras ingredients to the blender. The skin is packed with lots and lots of fibre which is good for the bowels and blends in it’s entirely, so there’s no need to be overly concerned about removal. Add all of the ingredients to blender and pulse on high speed until pureed.